'Harihara' is a bustling town located about 13 km from Davangere district. 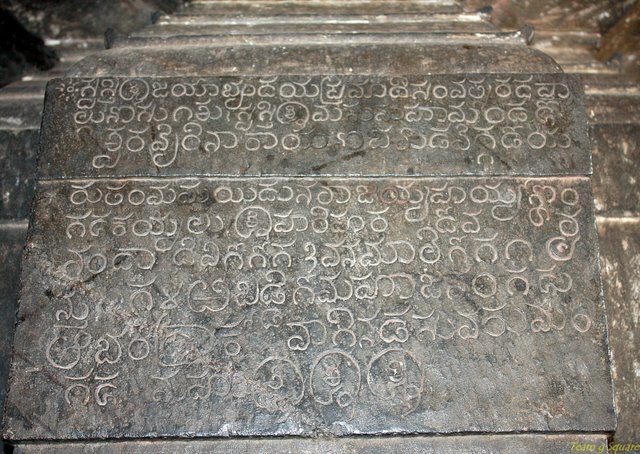 This place derives its name from the famous Harihareshwara temple situated here. The temple is dedicated to the Lords Hari (Vishnu) and Hara (Shiva). 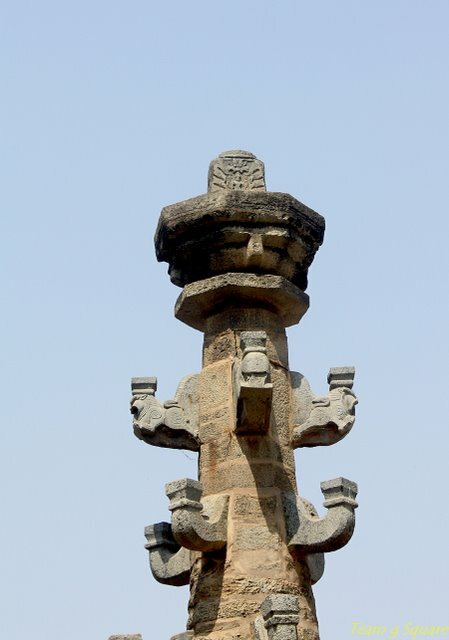 It stands as a classical example of the Hoysala architecture and is believed to have been built during the12th Century. Harihara is also known as Guharanya Kshetra or Dakshina Kashi. The idol of Lord Harihareshwara inside the Garbagriha is about 6 ft tall, with parts below the deity's knee being buried under. This idol is believed to be a Swayambhu murthy (Swayam:Self ; Bhu:Generate). 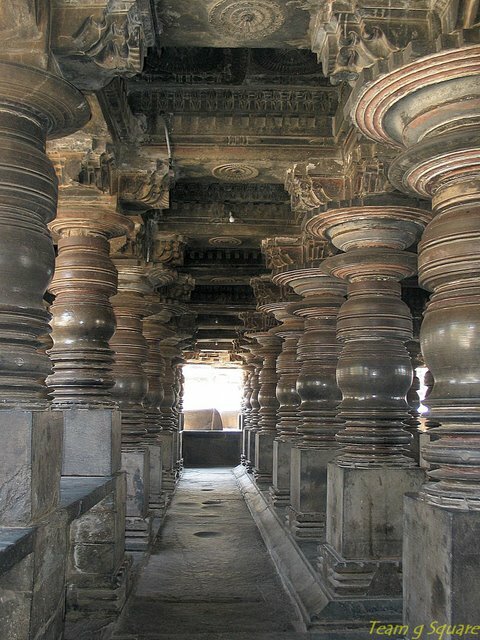 The temple has a huge Mukhamantapa with 60 pillars. 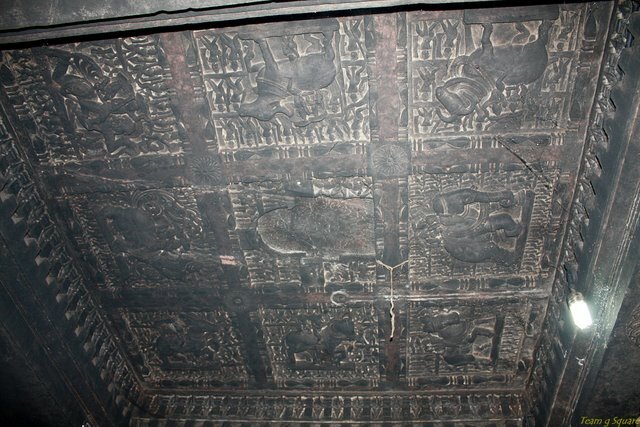 The exterior and the interiors of the temple are wonderfully carved. 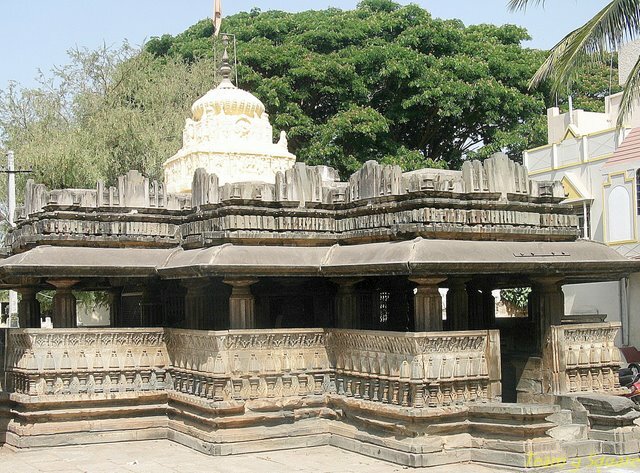 There is a temple dedicated to Goddess Parvathi inside the temple complex. 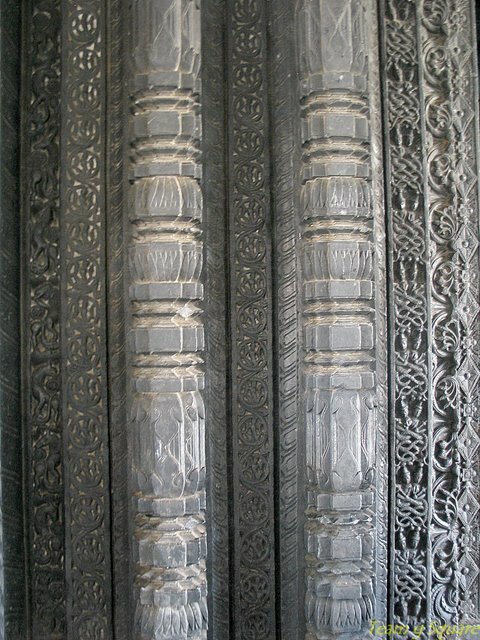 There are two beautiful Deepasthambas (pillars for lighting diyas) in the front portion of the main temple and many inscription stones inside the complex. A saint named Guha lived on the banks of the river Tungabhadra. He had the reputation of being cruel, cunning, and demonic. He desired to take control over the entire universe and thus, performed penance on the banks of the river to please Lord Brahma. Pleased by his devotion, Lord Brahma granted a boon for which Guha asked for himself to be eternal, and that it should be impossible for any man, demon, animal, god, or any other form of life, to kill him. Accordingly, and true to his word, Lord Brahma granted him this wish and left the place. Guha, after having gained the power of eternity began to trouble all life forms existing in the universe. Being troubled, noble men went to their favorite Lords to seek a solution for this problem. Thus, the form of the Lord Harihara (Shiva and Vishnu) was born in order to defeat Guha. Harihara and Guha fought war for many years, with Guha finally accepting defeat and begging for Salvation. 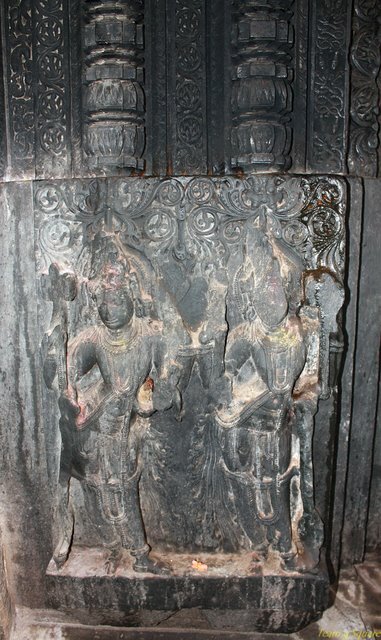 After being pardoned and granted salvation in the form of Lord Harihara standing on his chest, Guha entered pathala and the Lord remained there with his feet buried under. Thus the image of the deity here is only visible up to the knee. The deities in the temple are worshiped regularly and the temple is very well maintained. Places to visit around: Davangere, Uchangipura, Uchangidurga, Kankakuppa, Chitradurga, Ranebennur, Haveri, Harpanahalli, Bagalli, Anekonda, and many more. Beautiful place! I have passed this place so many times but never happened to visit! I will some time soon! 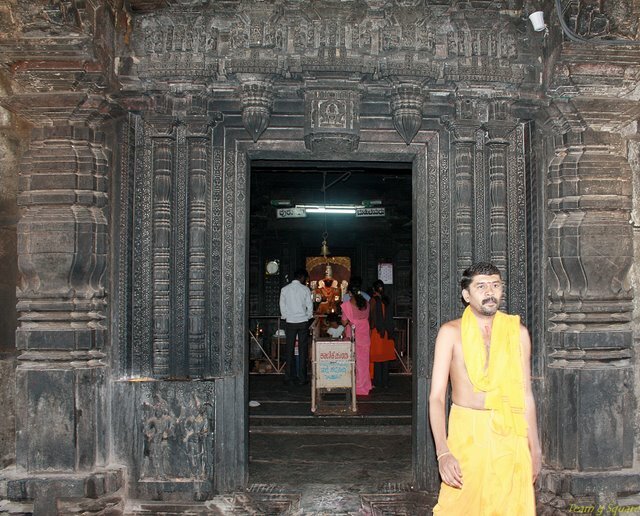 What a fascinating story of Guha and how the temple came into being. The artwork just leaves you mesmerised. Loved the pics, they are all so beautiful. Great pictures, but I enjoyed the stories even more! top class photos. all great shots. Interesting legend how Lord's feet got immersed and the corridor with beautiful shining pillars awesome. Nice write up and lovely captures. Loved those pillars!! As always, the carvings are fantastic! 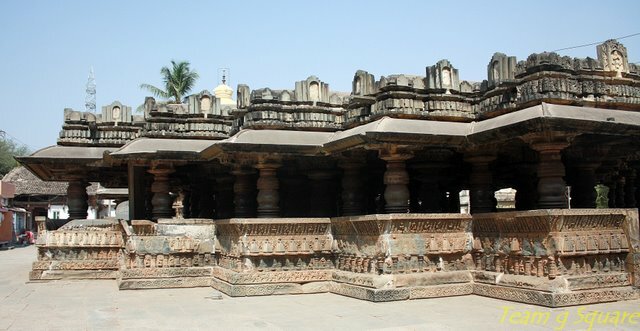 Another Hoysala masterpiece.. Its indeed extraordinary that a small dynasty can make its mark in the architecture world.. Very enlightening. Thank you for those pictures too. 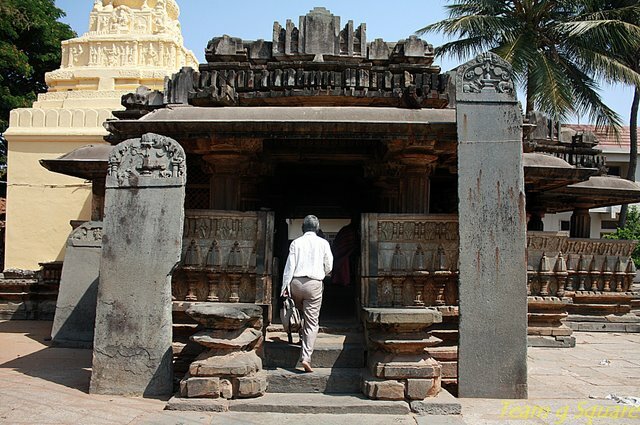 What would u say are the prime characteristics of Hoysala architecture.